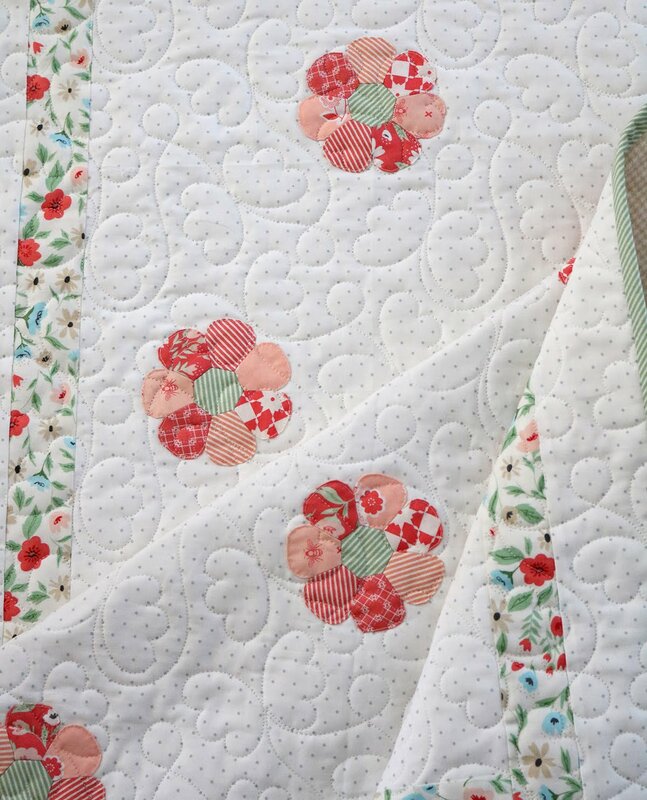 On this snowy Saturday I have a sweet little baby quilt finish to share with you. 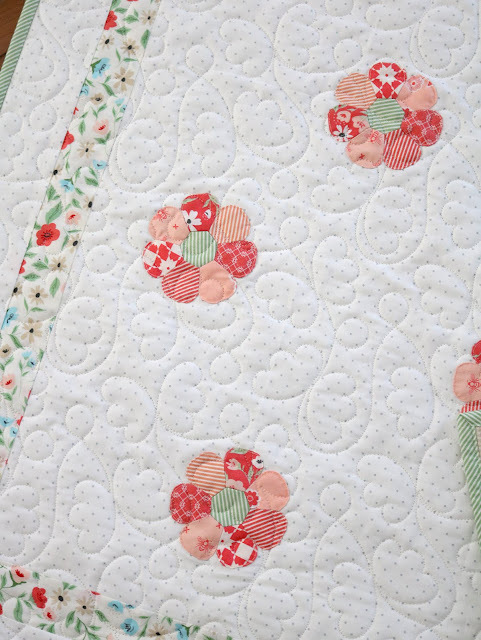 And this is quite possibly the sweetest little baby quilt I've ever done! 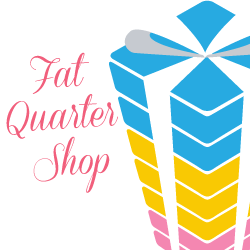 It's almost too dainty and feminine to stay too long in my house full of boys :). 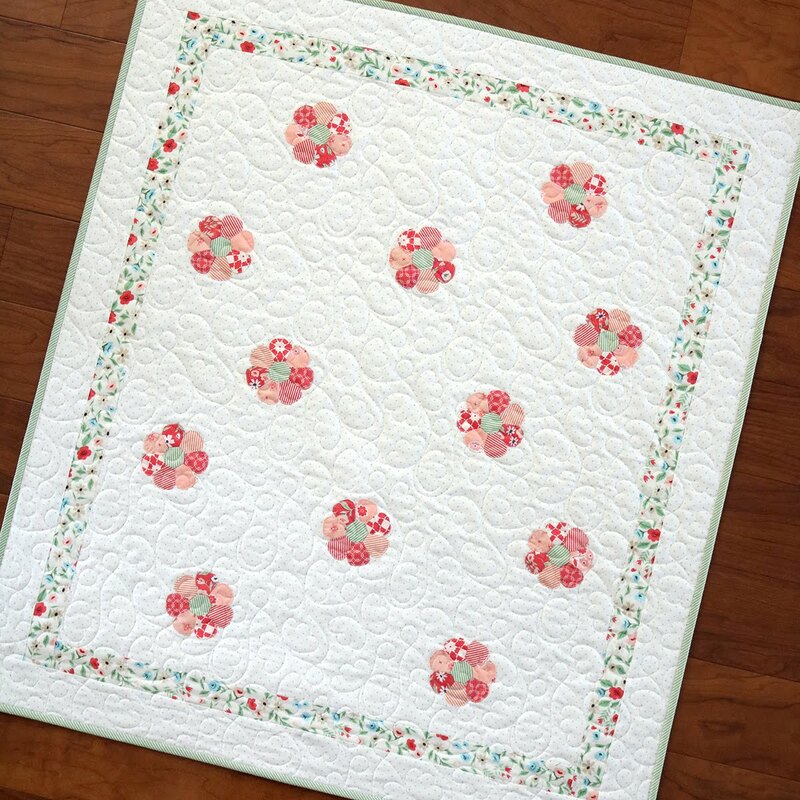 The pattern for this Sweet Daisy baby quilt is from the new book by Sharon Burgess, A Stitch In Time (Tuva Publishing). 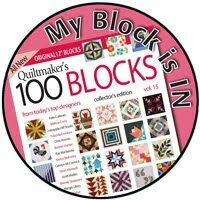 This book has 18 fun English paper piecing projects ranging from a small pincushion to pillows, bags, placemats, a dolly, and this baby quilt. That's quite a range of projects! Even though the book is filled with lovely English paper piecing projects, it's not just EPP. 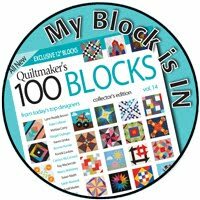 Each project does have an EPP element to it, like this quilt-- but if EPP isn't your forte, you could still tackle these projects and have fun doing it! 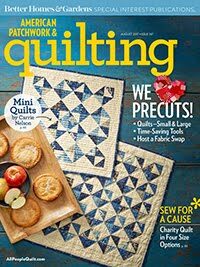 I feel like this quilt would be a good project for someone that's new to English paper piecing. Each flower is made (hand stitched using EPP) and then they're appliqued onto a background fabric. 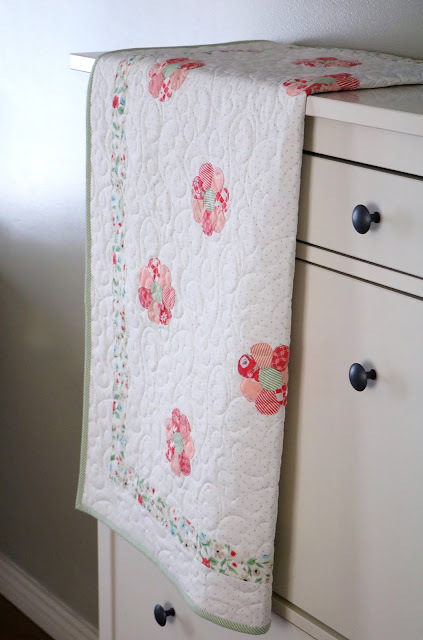 Then one simple floral border frames everything beautifully! The finished quilt measures 35" x 40". 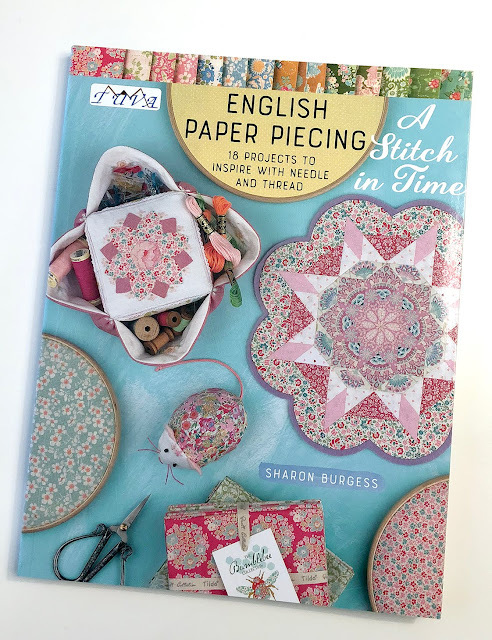 You can find the A Stitch In Time book here on Amazon, and if you're on Instagram go and check out the other projects from the book under the hashtag: #astitchintimeepp. 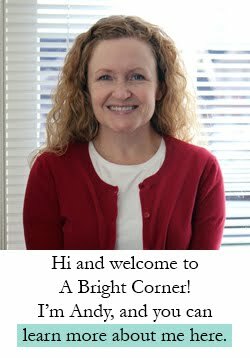 It's been fun to see what others are making from the book! 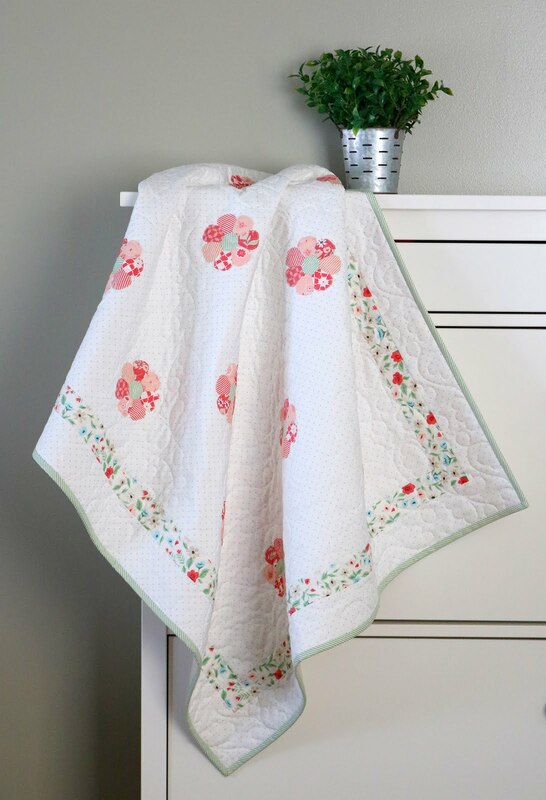 The fabrics for this quilt are all from the newest line from Lella Boutique called Garden Variety (Moda) and they should be in your local quilt shop now! But I'm guessing they won't last long. At my local shop several of these bolts were already looking pretty thin. It's beautiful and so soft for a baby girl! 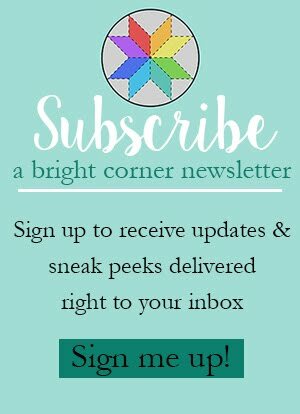 So you have snow there? We are to get ice and snow 5-8" this weekend. Very cute, and the butterfly quilting just adds to the pretty flowers. Thank you. 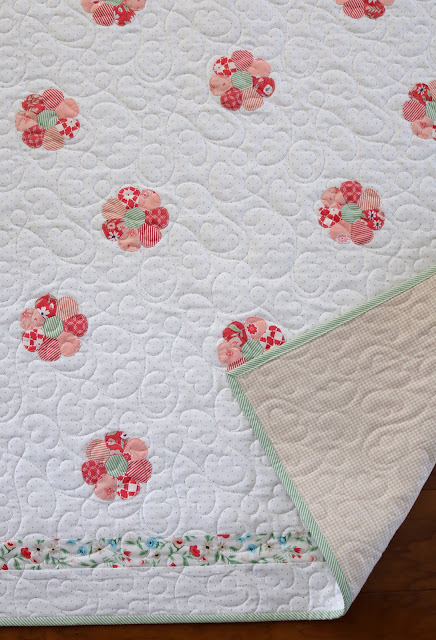 This is such a sweet little quilt, perfect for a baby girl! 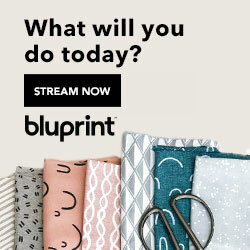 Love that fabric line you choose!